We have consolidated our two locations into one great store located on South West Archer Road across the street from the BP Gas station, Cloud 9 Spa, and Beef O’Brady’s. This complete Auto Care Center is designed to tailor to your vehicle’s needs with its knowledgeable and friendly staff! This center provides a comfortable waiting area, including a desk area for working, and FREE Wireless Internet Services. In addition to the 5 full capability vehicle service bays, this facility includes one of Gainesville’s ONLY 4-Wheel Drive/long-bed/dualie/RV alignment lifts. Andrew Bader is the Service Manager. 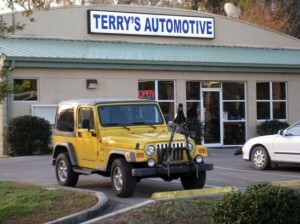 Call Terry at (352) 377-2886.